Sailboats utilize sails to catch wind, allowing them to move forward. However, “catching the wind” is only possible when the boat is sailing downwind; the rest of the time, the sail works to conduct movement. 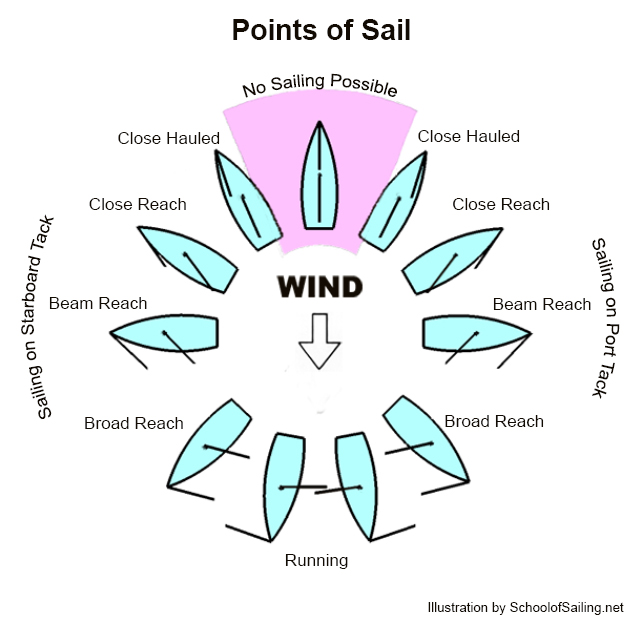 Here are some basic explanations of how your sail will work in varying wind conditions. A sail will “lift” or move toward the lower-pressure side of the boat, causing the hull to move. This happens because sails are curved like wings, which allow air traveling over the topside to travel faster than air traveling on the underside. The curvature of the sail is known as the “draft,” and it is built into the material by the sailmaker through the careful cutting and sewing of panels. A sail’s leading edge, also known as the luff, will point into the wind when properly trimmed. This creates a higher pressure on the windward (facing the wind) side and lower pressure on the leeward (away from the wind) side. Not all lift will move a boat forward. The direction of lift will likely be at right angles to the sail, so you may experience wind that pulls the boat sideways. However, the shape of your hull and keel, when combined with the rudder, will create enough resistance to drive the boat ahead. The total amount of lift will work to pull the boat forward, but the amount of sideways movement depends on your “point of sail.” This is the angle between the boat and the wind. The closer you are to the wind, the more sideways the boat will pull—the sail is trimmed in closer to the centerline of the boat. See below for a point of sail diagram. Most sailboats will move a bit sideways and ahead depending on the direction of the wind and point of sail. This is when tacking and jibing become important.